Has Shoreditch become the area it always wanted to be with its funky bars, numerous cafes and pop-up shopping mall, or is it moving away from its centre for struggling but exciting artists? I guess it depends on who you are. And while its lack of greenery, 60s tower block aesthetic and moneyed hipster fashion is really not my cup of tea – I, for one, quite like that fact that you don’t have to scour every little side street and try every door to find a bar or café. What I don’t enjoy so much is that most of the new venues opening have that ready-made chain feel to them. Lots of hip branding, a perfectly quirky menu and the fashionable but adaptable décor. 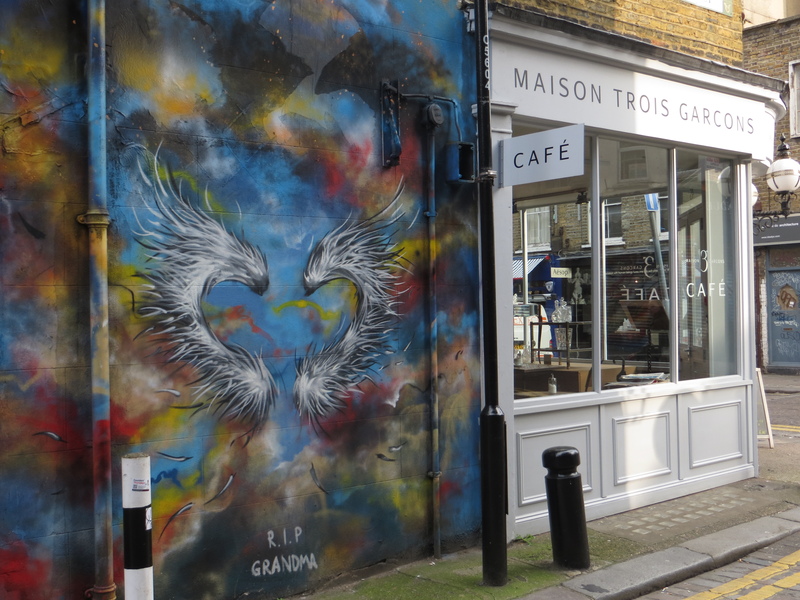 The street where this is most obvious is Redchurch Street, where I found Maison Trois Garcon, itself part of a mini chain. 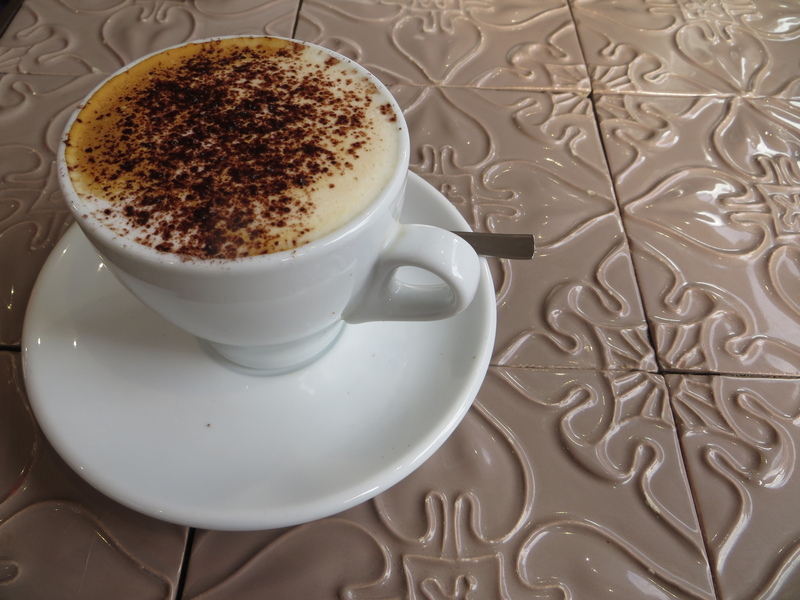 This is a French-style cappuccino – short and strong. But while in France, especially near the Italian border, the coffee would be tasty and super-powered, here it was a little bland. The first taste was chocolate. This was mainly due to the vast amount of the stuff dusted on top. With a small cappuccino like this, adding a thick layer of chocolate pretty much transforms it from a cappuccino into a mocha. Still, once I got through the sweet topping, it had a strong kick to it and wasn’t over priced. I actually quite liked it in here. Tucked inside the shop, the café is light and airy and has a few nice design touches. 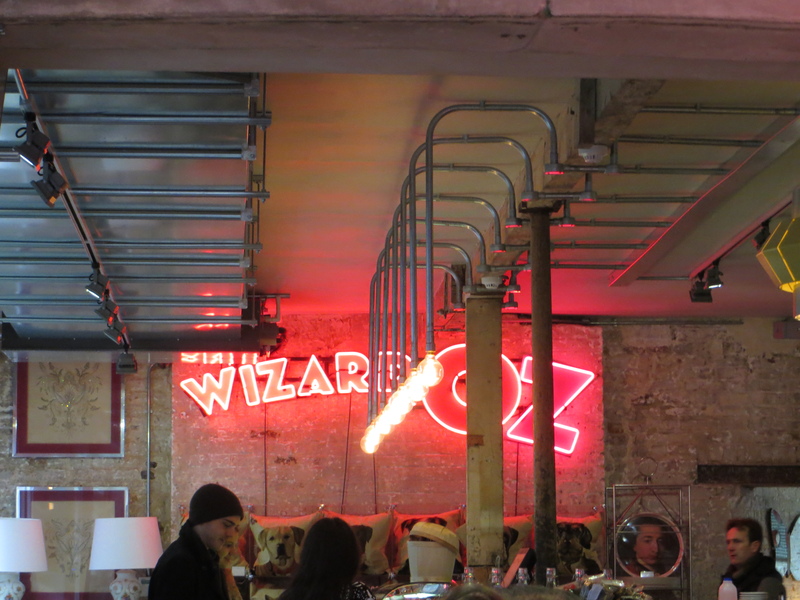 Yes, it has the bare brick/bare wood walls, but touches like the tile topped tables, balloon lights and huge glowing Wizard of Oz sign gave it a slightly surreal feel. It’s not a comfortable café but as far as shop cafes go, it’s one of the most interesting I’ve seen. A good selection of hot dishes including Lasagne and Meatballs along with sandwiches, salads, baked goods and an afternoon tea service. It is a small but perfectly formed offering. No complaints here. Fast and efficient. Table service is available or you can just go up and place your order and pay at the till. Either way seemed to work – which may sound like a simple thing to accomplish but you’d be surprised by how many cafes can’t manage this. While strictly speaking you could argue that the café is an extra to the shop, as I’m coming from the coffee-based point of view I’m viewing the shop as an extra. It’s full of interesting items and you can almost browse from your seat. While not outstanding as a café, it has enough quirks and character to make it worth a visit. And it makes a change from the usual super hip cafes in the area.